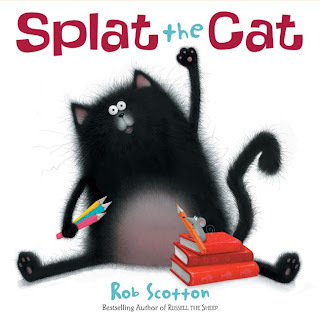 The awesome Rob Scotton, author/illustrator of Splat the Cat and the Russell the Sheep series, will be stopping in at 3 pm on Wednesday, September 3rd. Come meet Rob and get your books signed! Need a last-minute beach or poolside book for lazing about on Labor Day? Never fear -- we're open our normal hours (10 am to 7 pm) on Monday, September 1. We now have a Del.ici.ous account! Easily access all the links to great articles, author/illustrator websites, video clips, and more we post here in Notes from the Hut. You can also send us links you think we'll like by tagging bookmarks "for:curiousgeorgeblog" in your own Del.ici.ous. Jane Yolen is so totally coming to Curious George. How exciting is that?! 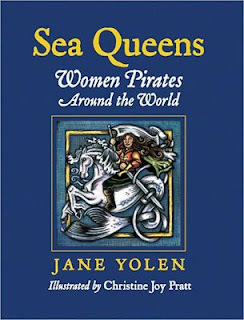 The prolific and genre-jumping author extraordinaire Jane Yolen will visit Curious George on September 21st to promote her latest non-fiction book Sea Queens: Women Pirates Around the World. Yolen, best known for Owl Moon, Devil's Arithmetic, and the How Do Dinosaurs... books (Though these favorites are really only the tip of the iceberg. Yolen has published over 300 titles!) will sign and read during her appearance at Curious George, and we will have an ample supply of all of our favorite Yolen books on hand for purchase and sharing. Don't miss our biggest author event yet! 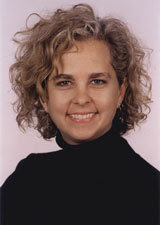 Local story-teller and two-time Newbery Medal winner Kate DiCamillo, star player down the road at Candlewick Press, and the woman responsible for Winn Dixie, Edward Tulane and the adorable Despereaux is publishing again. Candlewick will release this latest addition to her middle grade treasure trove, The Magician's Elephant, in the fall of 2009. How we will wait a whole year for this book is a mystery. The Tale of Despereaux motion picture this holiday season could serve to tide us over, but we suspect the suspense will become too much to bear. On saints and sinners in YA. A host of recent YA titles have us pondering our afterlife options. In Donna Freitas's The Possibilities of Sainthood, Antonia contacts the Vatican to inform them of certain oversights in the canonization of patron saints -- most notably, the lack of a Patron Saint of First Kisses. As Antonia says, "it is virtually impossible to get yourself kissed . . . without some heavenly intervention," necessitating a saint to intercede in this delicate situation. Luckily, Antonia herself is more than willing to fill the position! career path is Cecelia Galante's The Patron Saint of Butterflies. Honey can't wait to leave the cultish religious community where she grew up, but Agnes is torn between her faith and her loyalty to her friend. Agnes's saintly ways are compromised when a dangerous discovery about the compound forces the girls and Nana Pete to escape. Honey and Agnes alternate narration, giving readers both girls' perspectives on their complex, confusing situation. Heck: Where the Bad Kids Go, by Dale Basye, presents "Heck" as a postmortem reform school for naughty kids. Milton (get it?) and his sister Marlo find themselves in Heck after a freak marshmallow accident kills them both. The teachers at Heck (including Mr. Nixon and Miss Borden) are bad enough, but Milton and Marlo must also endure bully Damian and draconian Principal Bea "Elsa" Bubb. With their new friend Virgil, Milton and Marlo make a desperate attempt at escape. In his melancholy novel London Calling, Edward Bloor uses a Philco 20 Deluxe radio to bring two troubled boys together -- across time and space. Modern-day Boston teen Martin and WWII-era Londoner Jimmy piece together Jimmy's memories with Martin's historical research to find the commonalities that connect them. London Calling explores the possibilities of life after death and time travel while prompting Martin (and readers) to question whether any secret can stay buried forever. Speaking of sainthood... We'd like to suggest the late, great Ursula Nordstrom, legendary editor of Harper's Children's Department, for Patron Saint of Children's Books. Any other nominations? Vampires, werewolves, and zombies, oh my! Raised in India and plagued by violent premonitions, Gemma feels isolated in her new London boarding school -- until she finds herself surrounded by a clique of girls obsessed with the supernatural. Clary is astonished to discover an entire world of fallen angels, demons, and demon-hunters. When this world intrudes upon her own, she is forced to join Shadowhunters Isabelle, Alex, and handsome Jace to protect those she loves. For Jonathan Strange, the practice of magic is both an academic discipline and his patriotic duty as an Englishman. After fighting in the Napoleonic wars, Jonathan just wants to enjoy his new marriage, but magic and the realm of Faerie intrude upon his peace. Teenaged Tristran Thorn vows to bring his love a fallen star from beyond the Wall separating his village from the realm of Faerie. He quickly realizes Faerie is full of surprises -- not the least of which is the star herself! High school outcast Michael is a lucid dreamer; he can consciously control what happens in his dreams. Michael discovers that the line between reality and imagination is fluid when his dreams begin to influence his real life. Vivian, a werewolf, falls for a human named Aiden. Can she keep her true identity from Aiden and her relationship with a "meat boy" from her pack? In the Beaumont family, everyone discovers a special talent at the age of thirteen. Mibs is impatiently awaiting the onset of her "savvy," but when a family emergency strikes she becomes desperate to discover her power. Sabriel is next in a long line of Abhorsens, a family of necromancers dedicated to binding the dead. When her father, the current Abhorsen, disappears on a mission in the magical Old Kingdom, Sabriel sets out to save him. Eragon discovers a strange blue stone, which forever alters the course of his life when it hatches a baby dragon. As Eragon and Saphira become inseparable, forces both good and evil seek to dominate this new dragon and Dragonrider. Other kids call Mason "slow," but he has an amazing extrasensory ability. His sadistic older brother Gene uses his own talent to harm others. Can Mason summon the power and courage to stop Gene? Angel Aeriel must decide whether to destroy the vampire Irrylath or attempt to save him by restoring him to his human form. Victor Frankenstein uses grave-robbed body parts to create an undead man, but can't control him. A vampire is stalking through Quincie's Texas hometown. Quincie and her half-wolf friend Kieren must track down the vampire before the killings shut down her family's vampire-themed restaurant. Hundreds of dead teens are coming back to life, and must be reintegrated into society -- starting with high school. Vampirism is less mystical than biological in a parallel NYC; Cal contracts the "vampire" parasite after an encounter with a mysterious woman on his first night in the city. He joins an underground organization working to contain the spread of the disease. For some more analytical reading, check out author Gail Gauthier's response to Breaking Dawn (which has elicited conflicting, but equally strong, reaction from fans) and NY Times contributor Regina Marler's review of two new zombie novels. And if you're still thirsty for post-Twilight reading, come into the George for personalized recommendations from our staff! The fabulous folks over at The Horn Book directed us toward two great Little Brother-related links: the personal Instructables website and MySpace of protagonist W1n5t0n. Based around the hacker-approved web safety techniques used by W1n5t0n in the novel, his Instructables teaches readers how to encrypt their email, find hidden cameras, or cover their online tracks. His MySpace offers content less likely to get you investigated by Homeland Security (i.e., no instructions on "creating a cacophonous event"), including interviews with author Cory Doctorow and Little Brother banners for your blog or website. Don't forget to come to Curious George tomorrow, Friday August 8th, at 4pm to meet Susan Lendroth. Lendroth will be signing copies of her beautiful new picture book of 19th century Cape Cod, Ocean Wide, Ocean Deep. Hope to see you there! Mischief managed (and JKR as fairy godmother)! Harry Potter readers in Slidell, Louisiana, were the victims of an elaborate, Marauder-worthy prank earlier this week. Hundreds of fans stood in line at independent bookstore Book Sack to meet J.K. Rowling after rumors of a signing began circulating among the store's patrons. Unfortunately, JKR never showed -- understandably enough, since she was in fact not in Louisiana (or even the U.S.) at the time. After about an hour of waiting, disappointed fans began to drift away from the store. The latest official J.K. Rowling news should perk them up! The original copy of The Tales of Beedle the Bard, which played a crucial role in Harry Potter and the Deathly Hallows, raised more than £1.9 million (about $3.75 million) in a charity auction. Those of us without £1.9 million will be able to get our hands on this book of five Wizarding World fairy tales when it's published in December. The mass-market edition will feature "the Tales themselves, translated from the original runes by Hermione Granger," illustrations by J.K. Rowling, and "notes by Professor Albus Dumbledore." 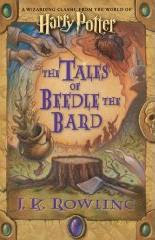 Currently preorders of The Tales are outselling both Stephenie Meyer's Breaking Dawn and Christopher Paolini's Brisingr. The high sales of the HP companion book will make a fairy-tale ending for the charity Children's High Level Group, who will receive all proceeds.